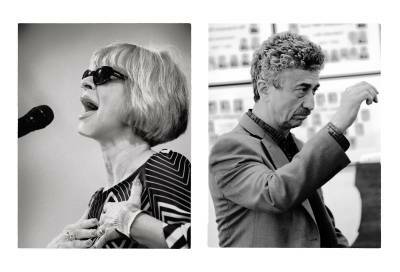 The Packing House celebrates the release of Love’s Tango, a collection of original Latin Jazz written by Connecticut musicians pianist/composer Alex Nakhimovsky and singer/lyricist June Bisantz. This independently released CD has been climbing the national airplay charts since late January, reaching #5 on the RMR Jazz Charts and #6 on the NACC Latin Charts and garnering excellent reviews along the way. Bisantz & Nakhimovsky have recorded, performed and toured together since 2005. This is their third recording project together and first writing collaboration. They share a love of Latin rhythms and jazz harmonies along with a serious playfulness that characterizes their musical partnership. The CD features bossa novas, sambas, a Rachmaninoff-inspired string quartet prelude and one unique tango, from which the CD gets its name. Also featured along with the many accomplished musicians on this recording, are renowned trombonist Steve Davis and smooth jazz guitarist Norman Johnson. On Saturday, May 4, June and Alex will host a CD Release Concert at the Packing House in Willington CT. They will be joined by renowned guitarist Norman Johnson and rising star bassist Matt Dwonszyk (percussionist TBA). Connecticut's best listening room - Bring some friends, a picnic supper and join us!